Pinterest has more than 100 million active users, with 47 million-plus of those users living in the United States. It’s therefore an ideal traffic store for those digital marketers advertising in America. Pinterest users are heavily female: Women make up about 85 percent of Pinterest (and of those, 42 percent are adult women with spending power). Although Pinterest is an ideal platform to target women living in America, Pinterest is growing both internationally and among adult male users: Pinterest is the fastest-growing social network by percentage, and one-third of new accounts are created by men. Pinterest users are in an open-to-buy mindset. In fact, 93 percent of Pinterest users plan purchases by using Pinterest. Studies have also found that when Pinterest traffic was referred to Shopify, it resulted in an average purchase of $50 from Shopify. 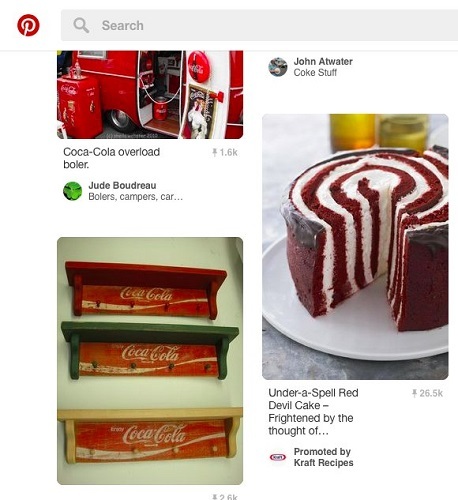 As a traffic store, Pinterest has a lot of potential, to say the least. To advertise on Pinterest, you create what is known as a promoted pin, which is an advertisement that allows you to target your market based on demographics, locations, and devices used, as well as people’s interests and the search queries that people type in. Pinterest, like Google, is run on a cost-per-click (CPC) basis with a budget that you can specify, and you pay only when someone clicks through the pin to your website. Similar to Twitter, Pinterest is a native advertising system; create advertisements that blend in with the platform so that the ad follows the form and function of any other piece of content on the platform. A promoted pin from Kraft. Before you create your promoted pin, research the keywords you intend to target. You can do your keyword research right on the Pinterest platform. Start by typing in the main keyword for your market in the Pinterest search bar. As you type, Pinterest gives you suggested searches, which are the most commonly searched queries that include your keyword on Pinterest. This technique helps you focus in on the keywords to target on Pinterest. You can also use online tools, such as SpinKeywords, to research keywords for your promoted pin campaign. Each promoted pin is allowed only up to 20 keywords, so when selecting the keywords you want to target, choose the most relevant keywords. If you choose to target more than 20 keywords, your promoted pin may be denied by Pinterest. Therefore, aim for 15 to 20 keywords per promoted pin. Next, when creating your promoted pin, select your image with care. The Pinterest platform is all about big, beautiful images, and for your promoted pin to stand out, you must use an image that is both eye catching and of high quality. Within your image, consider adding a simple, clear text overlay to your image that can serve as a headline and provide context to the image. The size and shape of your image matters on Pinterest; this platform is vertically oriented, so although horizontal images can work for promoted pins, strive to use vertical images whenever possible. An image size of 600 pixels by 900 pixels is a good place to start for your pin image. You want your promoted pin to be helpful, beautiful, and actionable. After you select an image that helps you create such a pin, write a detailed description that gives value to your market, addresses a pain point, and demonstrates the benefit of the product you’re featuring in your promoted pin. Remember that people don’t care about the product’s unique selling points (USP) at this point; rather, they care about what the product does for them and how it can make their life better. Address these concerns within your promoted pin’s description. Within the first 75–100 characters of your pin’s description, include the link to the product’s landing page. Including this link early in your text ensures that your link appears above the fold, allowing your landing page to be one click away from the Pinterest platform. Don’t use more than four individual images per pin. You want the images to be big and beautiful so that your promoted pin stands out, and having more than four images creates a busy pin with small images. If you decide to have more than one image in a promoted pin, be sure that each image has a clear focus and a theme. You don’t want to sell an assortment of random products in a pin; instead, the products should complement each other.